This post is sponsored by Borden Cheese. As always, all thoughts and opinions are my own. Oh how I love the days when my fridge is overflowing with Thanksgiving leftovers. So often we just enjoy them as mini Thanksgiving feasts as-is, but by Day 3 I’m ready for something other than a turkey sandwich with a side of green bean casserole! Our turkey turned out so magnificently this year I keep wondering why I don’t make turkey more often. Once I turned our leftovers into this festive holiday brunch, I realized we may have the perfect Christmas feast planned out, too! I think I’ll do a turkey breast with more Christmas-y sides but then keep this leftovers plan on hand for Christmas morning. The spicy pepper jack quiche with the sweet cranberry orange cinnamon rolls balance each other perfectly and only took a tiny bit of prep time and 40 minutes worth of baking. 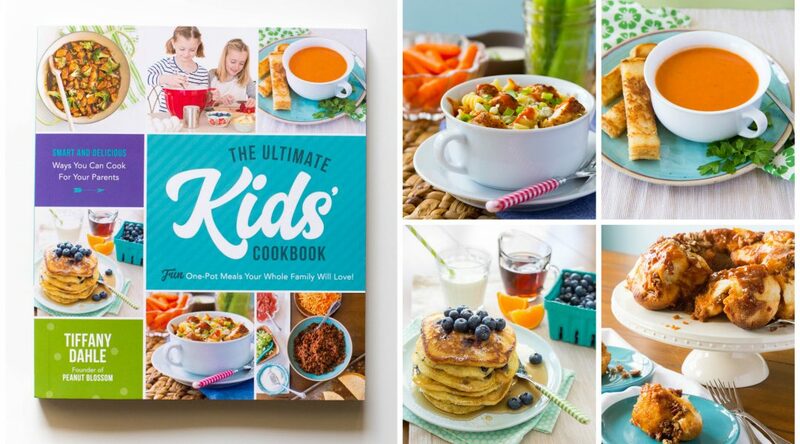 Add some fresh squeezed orange juice for the kids and a glass of mimosa for the adults and you’re ready for a party. 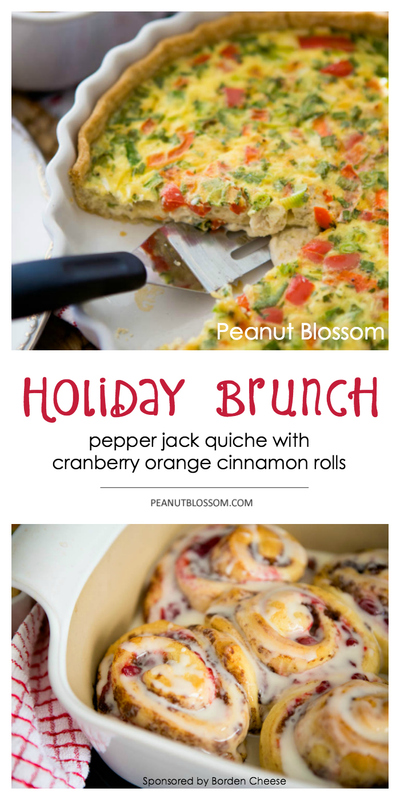 What to do with Thanksgiving Leftovers: Turn them into a holiday brunch! Both brunch items bake at 350 degrees. I have a convection setting on my oven to help things move a little more quickly. The quiche takes longer to bake than the rolls, so start with that and then add the cinnamon rolls to the oven once they’re prepped to maximize your time. 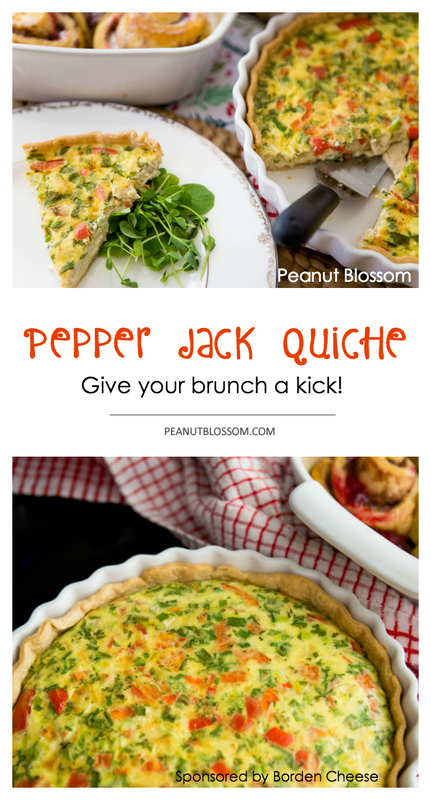 The pepper jack quiche is super easy to prepare and loaded with fresh veggies, leftover diced turkey, and slices of pepper jack cheese. To keep things extra easy, I relied on several prepared items from the grocery store: refrigerated pie crust, refrigerated cinnamon roll dough, and sliced Borden cheese. Mixing in the fresh produce, turkey, and leftover cranberry sauce kept the meal feeling fresh and homemade. 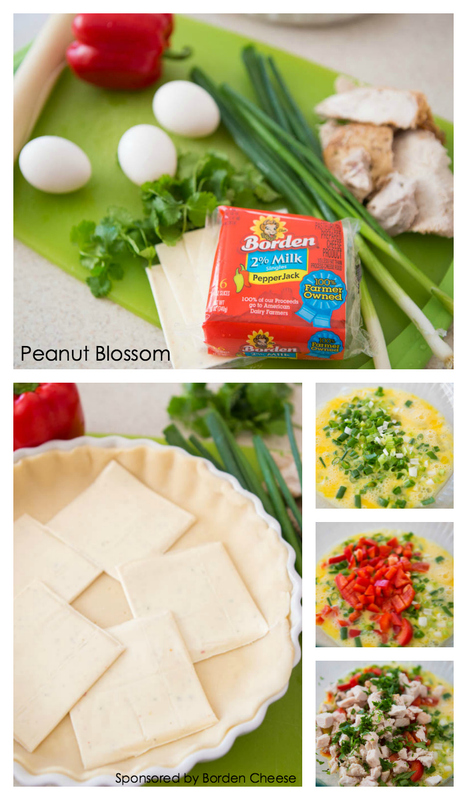 The ingredients for the quiche are very simple: eggs, milk, Borden Pepper Jack cheese slices, diced turkey breast, diced red pepper, minced green onions, chopped cilantro, and salt & pepper. Whisk everything together and pour into a prepared pie plate with refrigerated pie crust and you’re ready to go. I pricked the pie crust with my fork before laying 5-6 slices of Borden Pepper Jack cheese down as the first layer. Then I whisked all the remaining ingredients together in a large bowl and poured it all over the top. Bake it at 350 degrees for about 40 minutes until the custard is just barely jiggly and set. The Borden cheese melts so nicely, at the bottom, be careful when you’re testing the doneness that you don’t accidentally mistake the runny cheese for runny eggs. You don’t want to overcook it. If you don’t have a convection oven like I do, plan to bake your quiche for about 60 minutes. 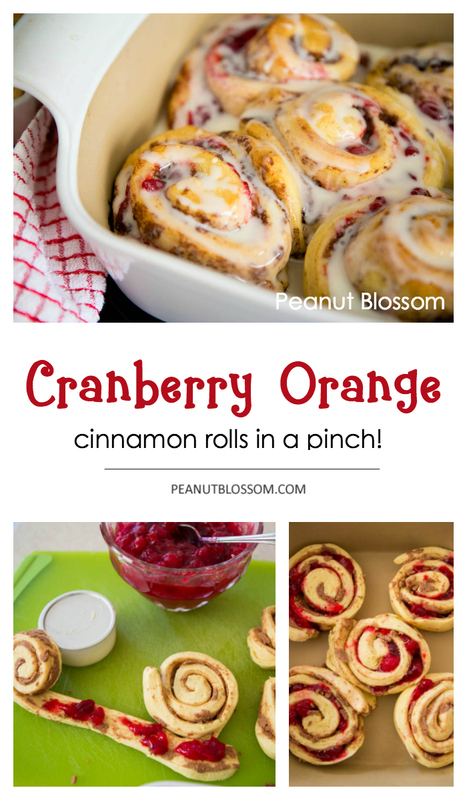 The cranberry orange cinnamon rolls are even easier to prepare. I simply unrolled the refrigerated cinnamon roll dough bun by bun and carefully added a dollop of leftover cranberry sauce. Roll them back up and place in a baking dish. Bake according to the length on the package instructions. (Mine were done in 20 minutes.) For the finishing touch, I scraped the glaze that came with the rolls into a mixing bowl and added just a splash of orange juice. It makes the frosting more of a runny glaze, but my whole family loved it. 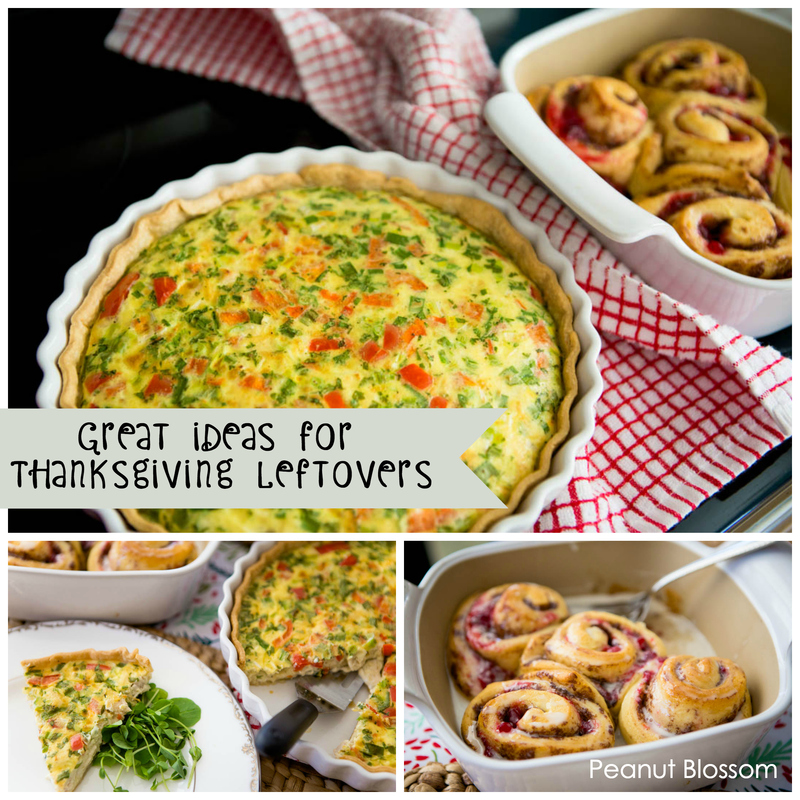 You can use whatever cranberry sauce you have as leftovers. 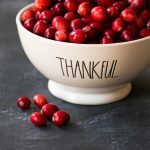 I always make the basic cranberry sauce from my favorite Thanksgiving cookbook here. It involves fresh orange juice in the mix which also gives a little zest to these cinnamon rolls. I was a little nervous about the kids trying this more adult version of brunch. (All those hidden veggies! The suspicious cranberries in their favorite cinnamon rolls!) They both gobbled it up. I was stunned. The Peanut loves spicy food and thought the turkey paper jack quiche tasted just like her favorite huevos rancheros (simple scrambled eggs with salsa.) She declared the cranberry cinnamon rolls to be better than the original version. I kid you not, she actually said: “Can this be my birthday breakfast? !” SCORE! P.S. If you’re a cheese lover like we are, check out the awesome recipe resource over on the Borden site here! So many great ideas. You can also follow them over on Instagram here and Facebook here. 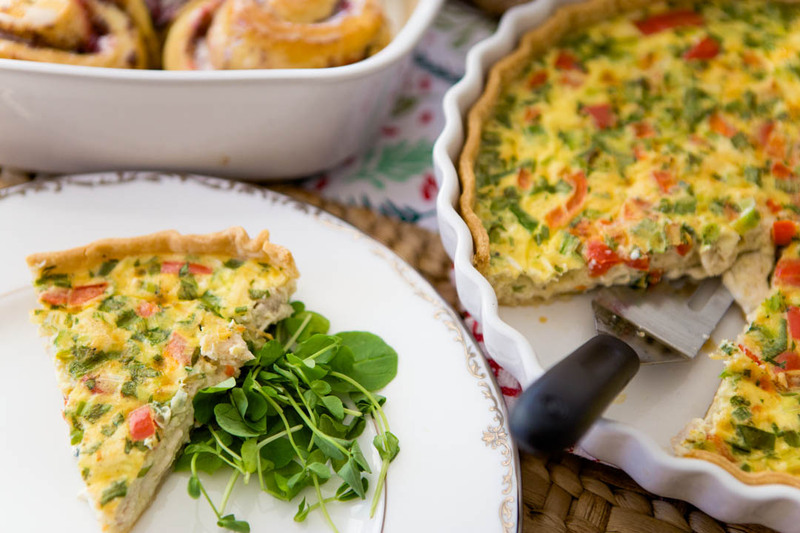 Perfect for a festive holiday brunch. Prick the bottom of the pie crust with a fork several times to prevent bubbles. In a large bowl, whisk the eggs and milk till smooth. Stir in turkey, onions, peppers, and cilantro. Season with salt and pepper. Pour into prepare pie dish. Bake for 40 minutes in a convection oven, 60 minutes in a regular oven. Thanks for giving me the useful information. 10-minute Trader Joe's meals: the best busy night dinners in a hurry! Too busy to plan anything fun for your family? Let me do the work for you! Join my FREE newsletter to get weekly ideas that will help you take advantage of the changing seasons.